We presenting something special for Web Designers and developers even this useful roundup can help software developers too in their modern techniques based projects, Today we are sharing Most Useful Cheat Sheets, most of the time we need some rapid solution as we listing in this beautiful article fact whether you want to learn something quickly or don’t want to get stuck on some petty nuances while working on an important project, you have to use some handy cheat sheets. XHTML 1.0 Strict doesnâ€™t allow this attribute in the code, so use this to keep the code valid. Change/add something for a certain browser. Another must have for designers. Matching color codes in CMYK, RGB and Hex was never this easy. The ASP cheat sheet is designed to act as a reminder and reference sheet, listing various of the oft-forgotten parts of ASP / VBScript. I no longer work full-time with ASP, so to ensure the cheat sheet was as helpful as possible, I roped in one Allan Wenham, an excellent ASP / .NET developer, to assist. This contains a list of the assigned character codes in HTML, with an example of how they are displayed, and description. A quick reference guide for MySQL, including functions (both in MySQL and PHP), data types, and sample queries. Available in PDF and PNG formats. If you are using two CSS columns, use this to make them exactly the same height. A quick reference guide for mod_rewrite, including server variables, flags and regular expression syntax. Also includes examples of commonly-used rules. An essential shortcut guide from the world’s best-selling creative magazine. A field guide to Scriptaculous. Want to let the users change there font size? 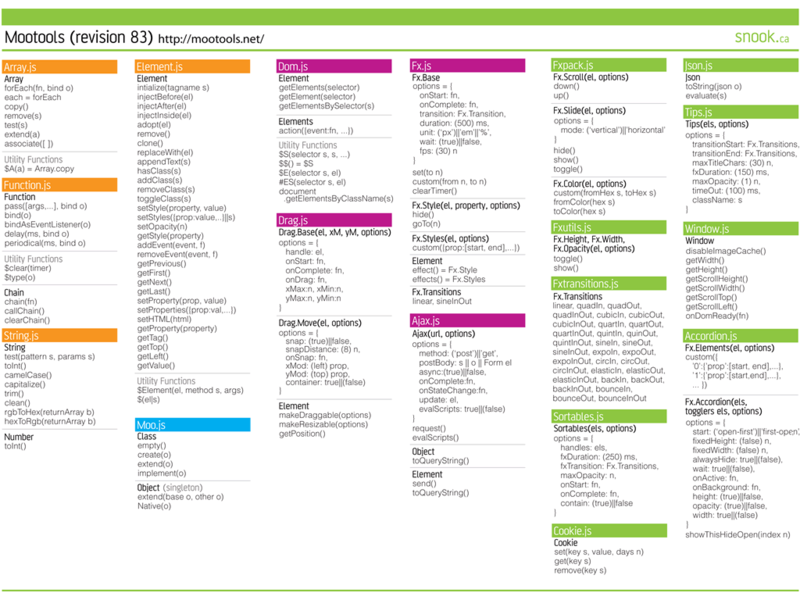 The Python Cheat Sheet, a quick reference guide for the Python programming language. What a resource, glad I ran across this! Hey cool list. I found the RGB Hex Colour Chart very helpful. In fact I was in search of a color chart that explained this and came across this post. Anyways great work. Also what theme is this blog ran off of? They are very useful. I added to my delicious. Thanks. Really valuable list and very useful for designers. Great collection of cheat sheets! Thank you for the time it took you to compile such a great resource! great collection! a real handy resource!! everyone should learn as smart developer. Pretty all inclusive list if cheats. Wouldn’t want to be a development virgin cause theres lots of things on these lists that should not be used. Once again cheating will get you caught out!